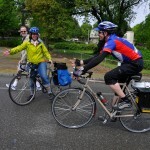 LEWISTON— It was one of the strangest bicycle rides in the world. Marvin Higday and Bob Day were clipping along on their lightweight bicycles thousands of feet inside the $36 million Clear Creek tunnel. 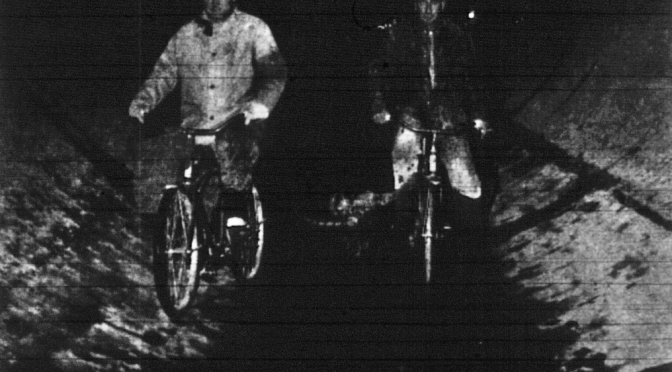 The 11-mile long, 17 1/2-foot diameter tunnel would have been quite an interesting bicycle commute, especially without today’s high-lumen bicycle headlights! 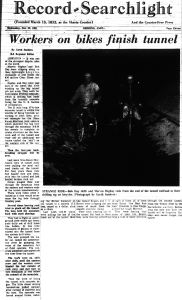 Redding has long history with the bicycle that we are just starting to rediscover through careful research. For this Independence Day, we thought we would take a look at at the bicycle parade that was part of Redding’s Fourth of July celebration of 1899. From North [Street, now Eureka Way]–down California street to Placer across Placer to Market, up Market to Trinity, across Trinity to Pine, down Pine to Butte, across Butte to Market, down Market to Yuba, across Yuba to California, down California to North. The bicycle parade in the evening was a thing of beauty. The possibilities of wheel decoration and illumination are almost unlimited. As the procession of silent but fantastic bicycles rolled by the crowd cheered its delight. The first prize of $25 [over $700 in 2014 dollars] was awarded to Mrs. T.L. Price. A Chinese umbrella formed a canopy above her and the rim of this was hung with glowing lanterns. The wheel was otherwise beautified. 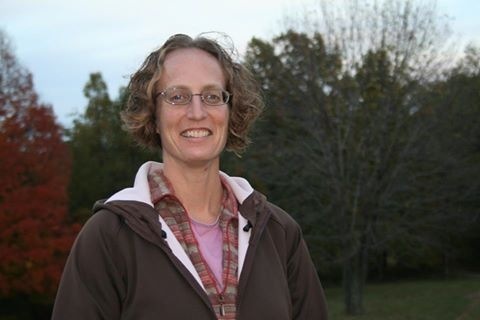 The second prize of $15 [over $400 dollars in 2014 dollars] was awarded to Mrs. J.E. Pollock and G.W. Schafer of Red Bluff. They rode a companion wheel [an early form of a tandem bicycle where the riders rode side-by-side] which was completely hidden by its decorations. Their canopy was lighted with small incandescent lamps. 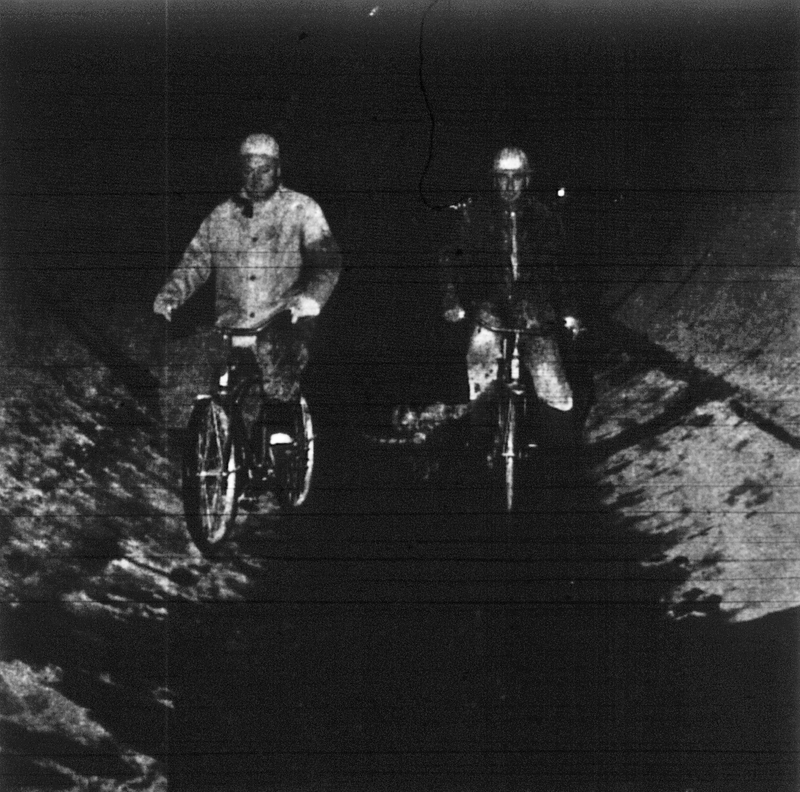 The third prize went to Harry Bush and George Lawry for their battleship Oregon which they had constructed about a tandem. Today, this tradition is carried on by Shasta Living Streets and friends, who ride in the Redding Rodeo Parade. 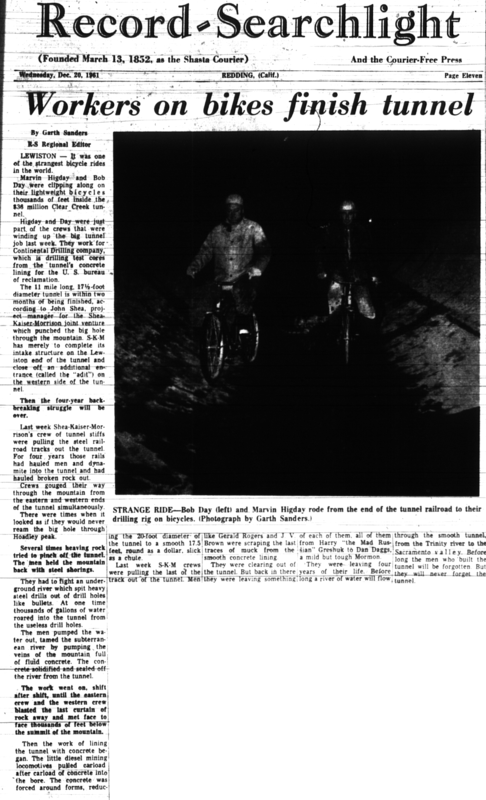 Stay tuned for more fascinating bits of Redding’s lost cycling history, and have a Happy Fourth of July! When the California Street right-sizing was initially completed, a large empty area was left on the east side of California Street to the left of the yellow line. 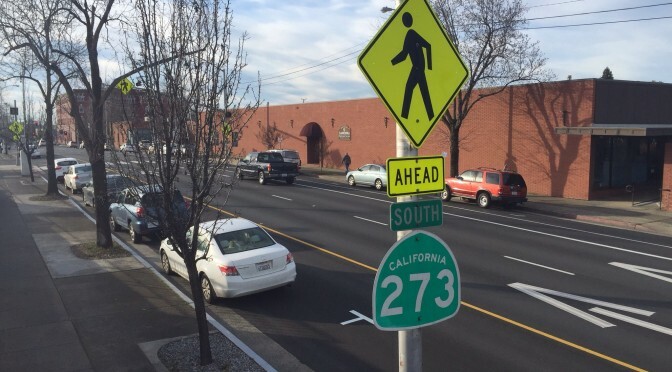 We felt this was a less than optimal choice, because we were concerned the wide, empty area would be used as a travel lane or encourage speeding. Happily. Caltrans recently returned and striped about a dozen on-street parking spaces along the east side of California Street. 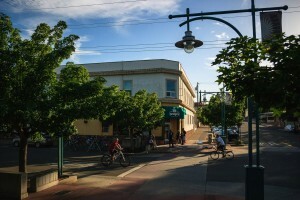 In addition to adding to downtown Redding’s already generous parking capacity, this has the effect of calming traffic: parked vehicles prevent motorists from using the area as an additional travel lane, the parked vehicles act as a buffer between traveling vehicles and pedestrians on the sidewalk, and the act of on-street parking discourages other motorists from speeding. This is a win-win: more parking for motorists and safer streets for everyone! Mark your Calendar! The first Community Workshop will be Wednesday, March 25 from 5:30 – 7:30 pm, in the Atrium at the south end of the Market Street Promenade. We hope you can attend this workshop to learn more about planning activities – and ways you can provide your input and ideas for improvements to downtown transportation. Your voice counts. Before you start to say it can never happen here, it’s already begun. 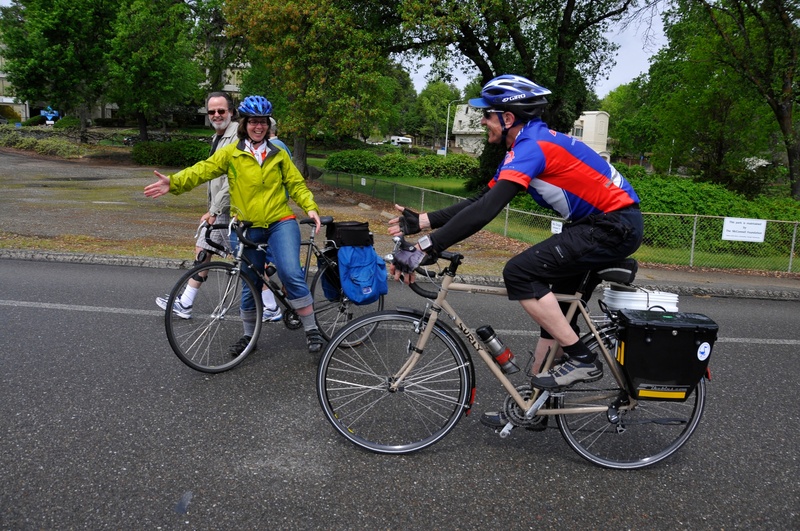 Shasta Living Streets sometimes gets described as a bicycling group. While we advocate cycling, it’s just a portion of our platform. Our full platform can be found in our name—living streets. Streets that are lively and accessible to everyone in our community: bicyclists, pedestrians, young, old, abled, differently abled, and yes, motorists too. The City of Redding has been attempting to revitalize downtown for fifty years now, to various degrees of success. 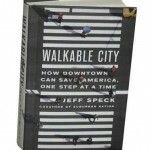 In Walkable City: How Downtown Can Save America, One Step At A Time, author and city planner Jeff Speck posits the key to making a vibrant city is walkability. His book, clocking in at a breezy 312 pages, is an engaging and easy read that encapsulates the Shasta Living Streets agenda as well as anything we’ve seen. We urge you to buy it, read it, share it with your friends, and join us to discuss it. So why should our cities and towns be walkable? 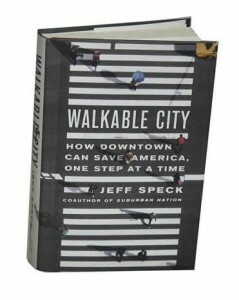 Speck observes, “surveys show creative-class citizens, especially millennials, favor communities with street life.” While Boomers and Gen-Xers grew up on TV portraying cities as dangerous dens of crime and the suburbs as pastoral ideals, millennials grew up on shows portraying cities as exciting and benevolent places full of life. This preference for urban living is becoming dominant and is expected to last for decades. Will they want to live in Redding or will they want to live somewhere else? As they age, Baby Boomers (25% of the U.S. population) are downsizing their large, isolated, suburban empty nests and seeking more compact neighborhoods where they can walk instead of drive as part of their daily lives. It makes sense; how many of us know an elder who has had to give up driving? What happens when they are stuck in their suburban home miles from stores and services? How alienating must that be? Between the millennials and boomers (the two largest demographic groups in America), the demand for walkable urban living has the potential be a large economic windfall; Christopher Leinberger of the Brookings Institute theorizes it will take 20 to 30 years to meet the pent-up demand. Will they want to live in Redding or will they want to live somewhere else? Living a walkable life means less spending on cars and more disposable income for local businesses. In cities from New York to Seattle to Detroit, housing in walkable urban areas fetches a 40-200% premium over comparable housing in suburban neighborhoods. The same principle can be found at work with commercial properties—during the recession, suburban office vacancies increased while downtown vacancies stayed put. Living a walkable life means less spending on cars and more disposable income for local businesses. 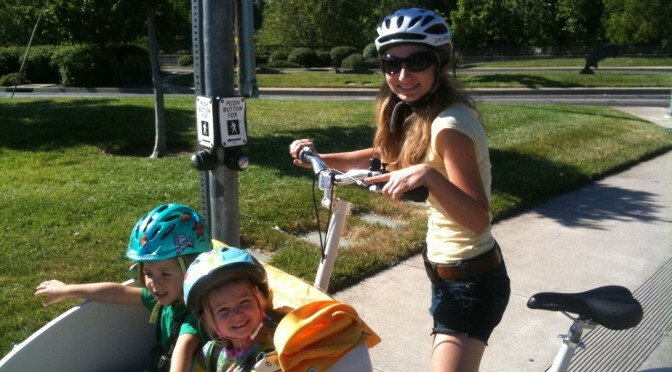 Studies have shown that the average American family now spends more on transportation than housing—“about $14,000 per family per year driving multiple cars,” according to Speck, and “almost 85% of money spent on gas and cars leaves the local economy.” If we made Redding walkable enough that only 1% of our families decided to go car-free, that could mean over 12 million dollars a year would be freed up for more discretionary—and local—spending. According to Speck, “one effort found for every additional five minutes Atlanta-area residents drove a day, they were 3% more likely to be obese.” The automobile also impacts public health through pollution, car crashes, and even higher blood pressure caused by sitting in traffic. Before you start to say it can never happen here, it’s already begun. More and more young professionals are moving downtown, citing its proximity to activities, events, businesses, and the river trail as its best features. Christine Stokes, Executive Director of the Shasta Historical Society, moved downtown to be closer to work and friends and quickly fell in love with the architecture and greenery. 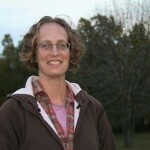 “I love being able to sit outside at a local restaurant for dinner and then take a stroll home,” says Stokes. Both Greene and Stokes still see a need for changes downtown—we’ll discuss these changes in a future article—but it’s becoming clear that with a little work, we can turn this kind of interest and commitment into a thriving downtown for everyone. Michael Kuker contributes policy analysis and communications strategies to help create more livable communities in our region. 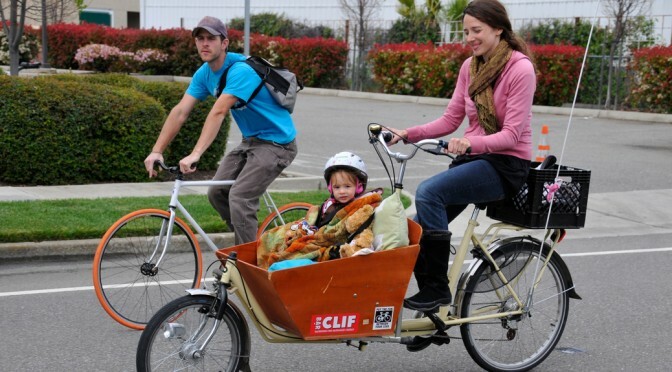 Bicycling is growing as more people discover the joys and convenience of bicycling. Businesses want more people to walk and bicycle because more foot traffic means more spending and social energy in local business districts. People want to walk or bicycle more in their daily lives to reduce transportation costs, stay healthy, and have more active lifestyles. At the same time too many people are still hurt or killed while bicycling. The average person will not join those of us who already bicycle and walk unless we overhaul our streets with safe streets and bikeways that connect our destinations and protect us from speeding car traffic. 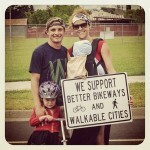 See all the people in our community standing- up and smiling big in order to support Better Bikeways and Walkable Cities, visit our Instagram. Support. 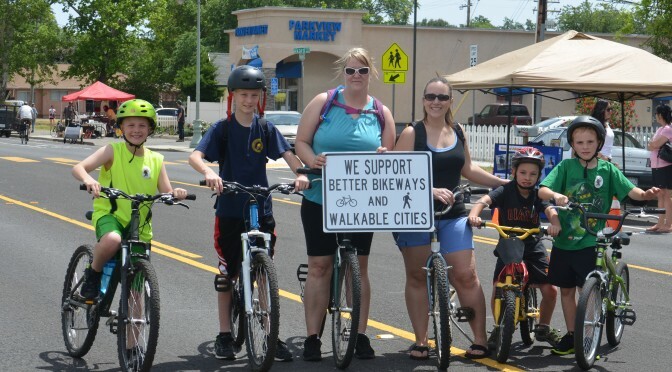 Shasta Living Streets works to share the broad support by individuals, families and businesses in our community for Better Bikeways and more Walkable Cities. Funding. We help local agencies secure more funding for implementation of changes on the streets and development of greenways and trails. Best Practice. We share information and facilitating conversation about best practice and innovations in street and neighborhood design so we can all better support improvements. Better Design. We help local agencies and cities plan for improved local standards and street design that meets the needs of individuals, families and businesses in our community. What makes towns and cities thrive: walkability. People in the Parkview and Garden tract neighborhoods can walk to downtown Redding in 15 minutes, but today they rarely do. The River Trail hosts many tourists looking for a place to eat lunch, but they have a hard time getting to local restaurants ten minutes away. People in our community regularly report they want to walk or ride a bicycle to local destinations but they do not feel safe because of traffic. Why is that? And what can we do about it? What is a walkable, bicycle-friendly downtown – and how do we get one? We are asking that question, sharing methods and examples about how towns can and do change, and hosting conversations across the community to build understanding and develop ideas about how to support improvements in our community. Would you like to join one of our discussions? Contact Anne at athomas@shastalivingstreets.org to plan a time to talk with your group. 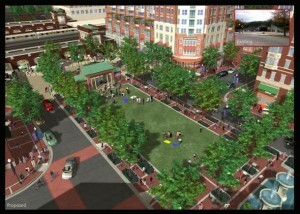 Walkable City: How Downtown Can Save America One Step at A Time. by Jeff Speck. 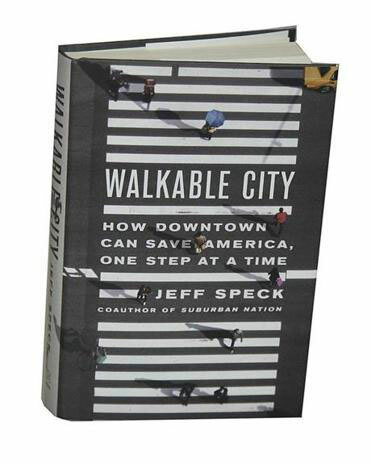 Jeff Speck is an urban planner who has dedicated his career to determining what makes cities thrive. And he has boiled it down to one key factor: walkability. His book does not describe a new approach, rather it is a readable overview of what has been known for over thirty years. What’s needed is: understanding, decision-making, and action to put good ideas into place. Welcome to our new website! We thought a new year deserved a new look, so we borrowed some of Santa’s more technically-gifted elves after Christmas and plied them with oatmeal cookies and Christmas leftovers. Our new website should be more legible on your tablet and phone, and features more images to show off our beautiful region. Let us know what you think! You have energy, expertise, a desire to learn more and contribute to your community in a real and meaningful way. We have a strong, local organization with a great reputation and an ever-growing list of opportunities to make a difference in this community. We have a group of talented people who contribute time and expertise to provide tangible products, services and events. We need your help. We are already making a difference – but the opportunity is great. Let us help you find a way to connect to this movement. Our goal is to have powerful impact with what we do – and have fun while we do it. Contact us today to find out how your skills and expertise can make a difference. Volunteer a little of your time: add your voice, work together virtually, minimize meetings and maximize impact. 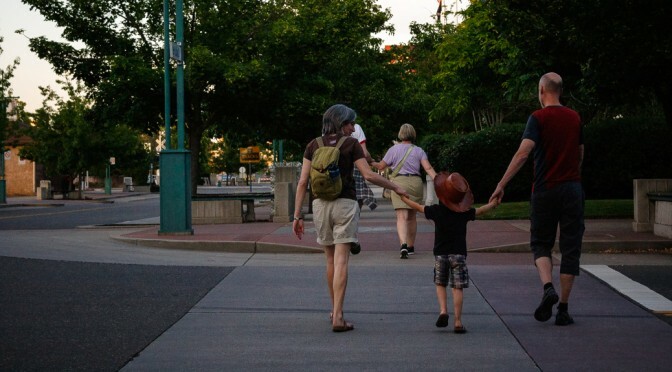 Shasta Living Streets is evolving to function as the grassroots backbone support organization to facilitate collective impact by a number of individuals and groups in our community who want to see our region become a more livable place. It’s about business, families and health. And brings more joy to everyone’s lives. Your support helps build great cities and towns in our region where everyone can lead an active lifestyle and bicycle and walk for everyday transportation, health, and joy. Shasta Living Streets builds prosperous communities by creating better bikeways and trails, walkable cities and vibrant public places where active living excellence brings a strong and secure economy and enables all people in our region to lead healthy and joyful lives. 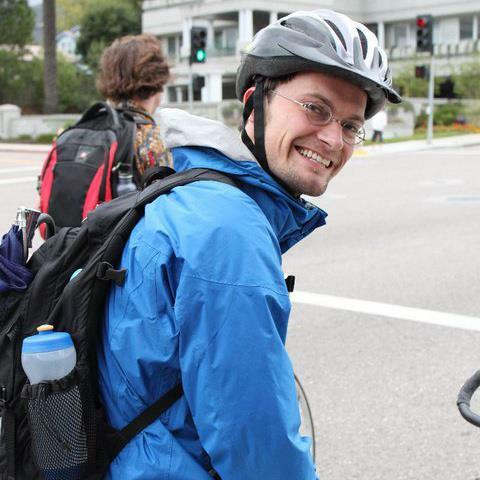 Together we build better bikeways, trails, walkable cities and vibrant public places. 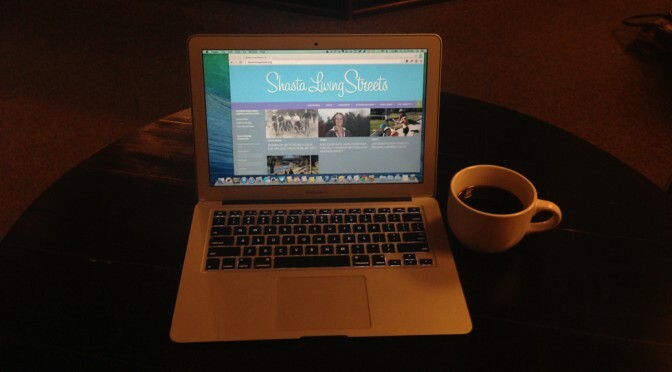 Your membership and donation to Shasta Living Streets is tax-deductible. Questions? Call 530.355.2230 or email Anne. Caring supporters like you ensure donated funds are used locally and help build excellence in our community.